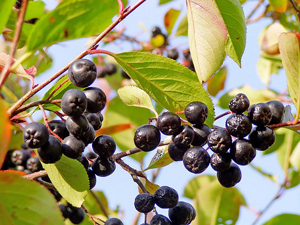 Native to North America, chokeberry (Aronia Melanocarpa) is a natural shrub with berries of deep purple, almost black colour. This humble berry is packed with essential phyto- nutrients, vitamins and antioxidants, especially when compared to other fruits and vegetables. Chokeberries contain an exceptionally high level of vitamin C and P, as well as mineral salts such as calcium, potassium, phosphorus, magnesium. Among other components one can add tannins, pectins and minerals such as molybden, iron and iodine. 100 mg of fresh berries provide about 35% of daily recommended level of vitamin C.
Black colour berries consist of significantly high amount of phenolic flavonoid phyto-chemicals called anthocyanins. Scientific studies have shown that consumption of berries on regular basis offers health benefits against cancer, aging and neurological infection. Fresh berries and chokeberry juice are recommended especially in cases of arterial hypertension, arteriosclerosis, gastritis, anorectal varices, anemia and chronic inflammation. The iodine helps to balance the hyperthyroidism. The presence of antioxidants is helpful to prevent cancer. Chokeberries can be eaten raw directly from the bush, but more frequently are processed as juices, syrups, dried fruits, jams, confitures etc. They perfectly match with other fruit such as apples or pears and can be used in cakes, muffins, baby food, pies etc Chokeberry syrup is a great colouring addition to ice-cream tops. In our agritourism farm "W Aroniach" we offer fresh chokeberries from ecological plantation for sale. However, you are most welcome to pick them yourself! We start the harvest around the 15 th of August. Finally; apart from all medicinal properties, chokeberry shrub is above all a very beautiful plant. 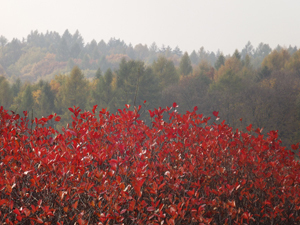 It blossoms in May with cream-white delicate blooms, during the summer the bushes are heavy with black berries and in the autumn the leaves get all the shades of red and purple.